Like Pixar, Studio Ghibli has a reputation for excellence. 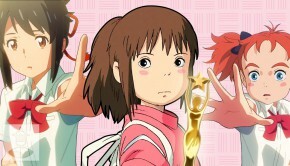 But how does the animation house that gave us My Neighbor Totoro and Spirited Away hold up when it comes to TV? Pretty well, actually. 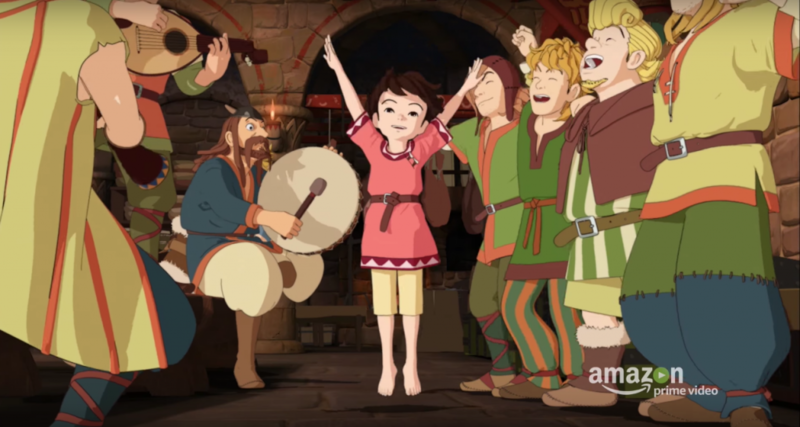 Ronja the Robber’s Daughter, a Studio Ghibli adaptation of popular the 1981 Swedish children’s book of the same name, premieres in the U.S. today for Amazon Prime subscribers. It follows the story of the titular character Ronja, daughter to the chief of a band of robbers and his wife in medieval Scandinavia. 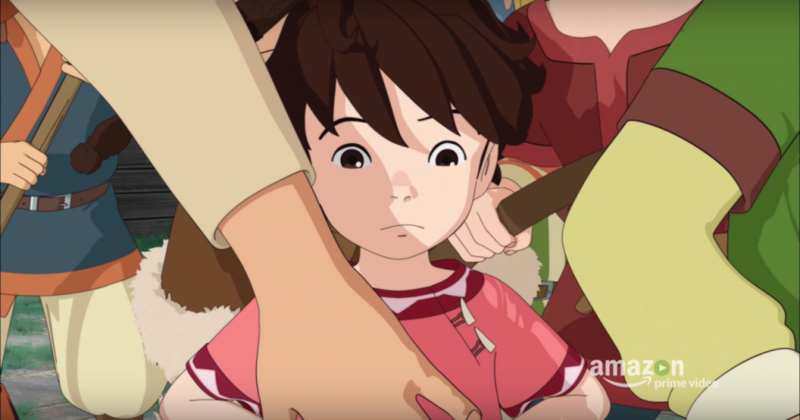 From the moment we meet father Mattis and mother Lovis, anxiously awaiting the arrival of their firstborn, Studio Ghibli’s penchant for building characters shines. Mattis is portrayed as a tough chieftain with a soft heart. He is immediately enamored with his little daughter, as are all of his men. They share a beautiful moment when Ronja opens her eyes for the first time and looks up at her dad, tears of love and pride welling in his eyes. It’s a simple scene that speaks volumes about their relationship, but it’s hard to imagine most children’s entertainment taking the time to include it. As parents, Mattis is fiery and melodramatic, while Lovis is steady and knowing. It’s easy to find moments where Ronja takes after both. Through the first few episodes, Ronja grows up under the watchful eyes of her parents and the robber band. It’s clear they’re playfully helping her learn a robber’s skillset, and by the time she’s 10, Mattis decides it’s time to let her explore the woods that surround his ancestral fort. I’m still not sure why Ronja had to venture out alone for her first journey beyond the castle walls. Perhaps it’s a rite of passage? 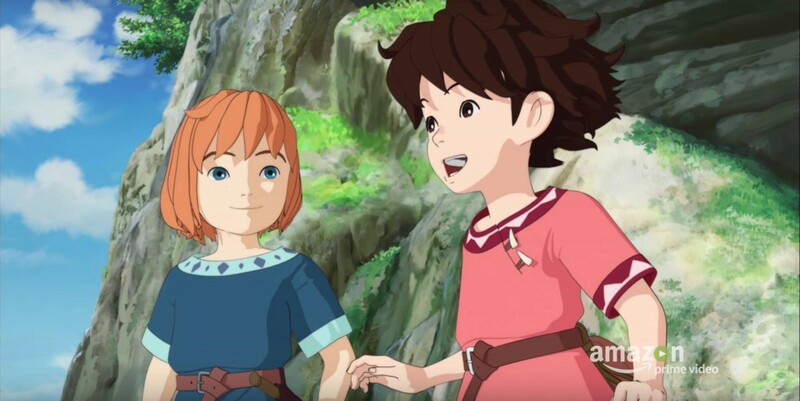 But Ronja finds a lot to love about the outside world, echoing a long Studio Ghibli tradition of appreciating and respecting nature for its beauty and peril. 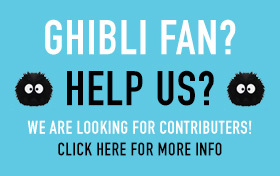 Longtime Studio Ghibli fans will expect the sometimes slow pacing of the show. While some people might find Lovis meditatively stirring a cauldron of soup boring, it’s these quiet moments that elevate the show and differentiate it from most Western children’s television. 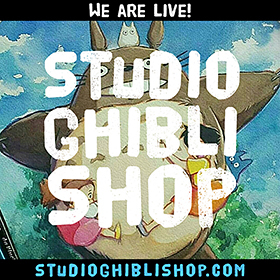 Studio Ghibli animation caters to a range of maturity levels, from the tough and bloody Princess Mononoke to the youngster-friendly Ponyo. Ronja seems to fall on the younger side of the line, with a lighthearted plot and lessons about love, friendship, and growing up. There is a moment in the forest where Ronja is attacked by some genuinely creepy creatures, but for the most part the thrills are gentle ones. Of course, as she gets older, Ronja finds the stakes are raised. 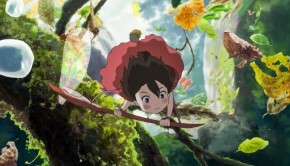 Though aimed at younger audiences, Ronja still held my attention through several episodes at a time. Part of the draw is the narrative nature of the show. Instead of an episodic, topic-of-the-week format, Ronja operates as a long, arching tale, with each of the 26 episodes advancing the plot. That and the well-realized characters kept me hitting the next episode button. One aspect of the show that might bother fans is the modern animation style. 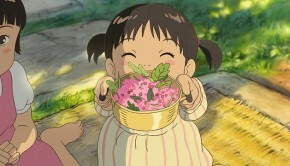 Studio Ghibli’s films are primarily (but not exclusively) created using traditional hand-drawn animation techniques, the personal preference of studio co-founder and animation icon Hayao Miyazaki. 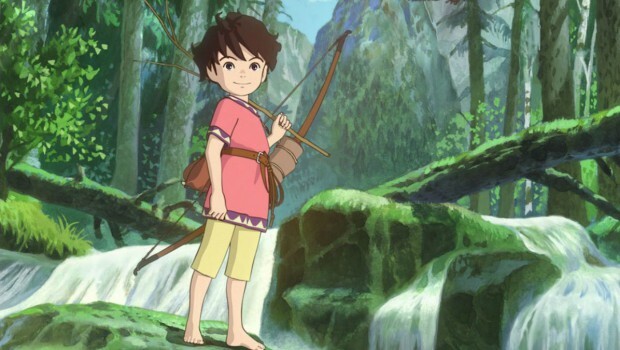 His son, Goro Miyazaki, who directed Ronja, used computer animation and cel shading on the show. 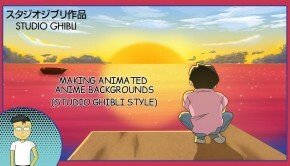 The result can be jarring for fans used to seeing the softer and more detailed look of Studio Ghibli movies. The characters in Ronja are clearly CG, though the static backgrounds are beautifully detailed and more in line with traditional animation. While I struggled with the difference through the first episode, by episode 3 I was used to the art style. If the execution of Ronja is a sometimes awkward change of pace, the story is different in a refreshing way. Children’s properties in the U.S. too often portray clueless or disengaged parents, or worse, parents who are absent or dead. Ronja is a rare look at a loving family, including a dad so enamored with his daughter he skips out on his robbery work to feed her just for the joy of it. His tough clan is softened and humanized by their close relationship with the little girl, bringing her small tokens like pinecones and feathers to play with. This early bonding pays off later in the show when it gives emotional stakes to more serious events. Even Mattis’s enemies (including his rival’s young son Birk who befriends Ronja) are given charming moments and humanizing traits. 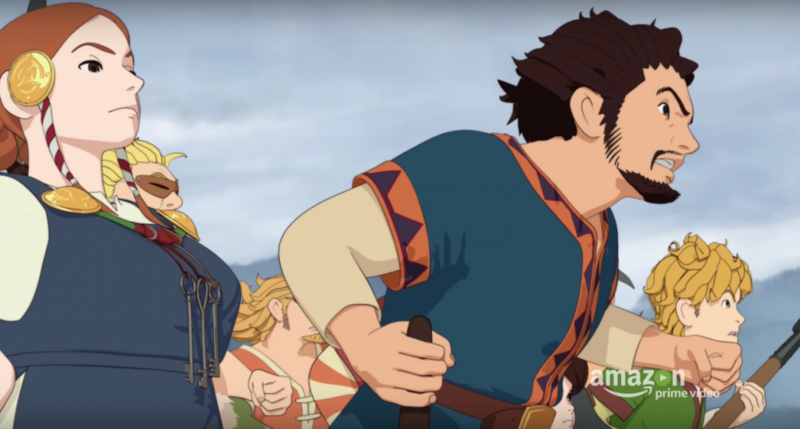 Instead of emphasizing tired lines between good and evil, the show gives a very human greyness to conflict that lets Ronja step up as a moral compass. I went into Ronja expecting swashbuckling adventure. While that’s certainly present, Ronja goes deeper, offering an intimate coming of age story both kids and adults can appreciate.